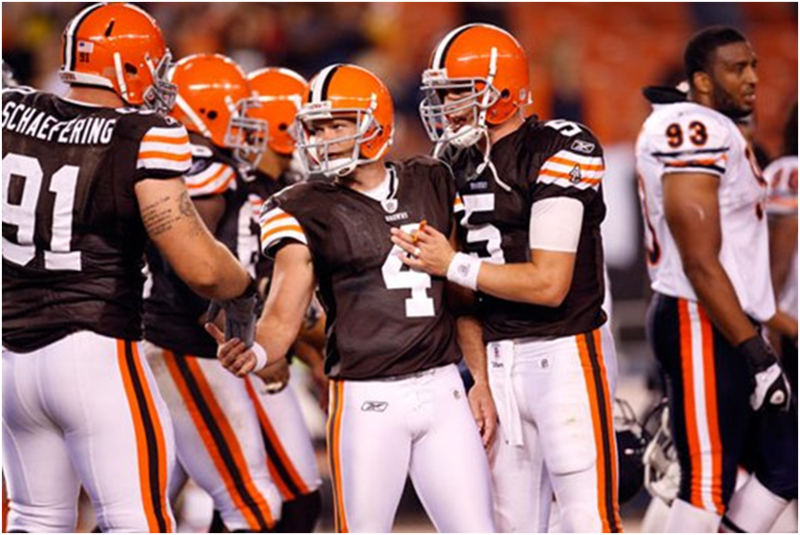 K Phil Dawson celebrates with his teammates after drilling the game-winning FG. CLEVELAND, Ohio -- Browns rookie running back Montario Hardesty's preseason debut was good while it lasted. But it ended prematurely with an injury to his left knee. It brought the Browns' preseason to a thudding conclusion, with Hardesty talking dejectedly after the game with crutches lying in front of him and an MRI exam waiting on Friday. "I can't say it's not frustrating," Hardesty said. "I've just got to keep my head up and keep working in the program." 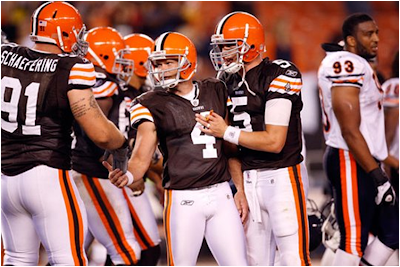 The Browns pulled out the win over the Chicago Bears, 13-10, on a Phil Dawson 36-yard field goal as time expired. The victory evened their exhibition record at 2-2. Dawson earned both wins with field goals on the last play. In perhaps his last act as a Brown, quarterback Brett Ratliff patched together the game-winning drive in the final 2:18. Veteran receiver Bobby Engram had two catches for 21 yards on the drive. Coaches always manage their final preseason game with fingers crossed, hoping to avoid injuries. But this could become a routine occurrence whenever Hardesty takes the field. The talented back's injury problems at Tennessee have been well-chronicled. Now he has hurt both knees before playing a regular-season game. A bone bruise on his right knee caused Hardesty to miss 27 days of training camp and three preseason games. That's the knee on which Hardesty had surgery to repair the dreaded anterior cruciate ligament tear as a freshman in 2005. The injury to his left knee occurred on his seventh carry in his preseason debut against the Bears. That's the knee that reportedly received an arthscopic procedure in 2006. Hardesty started the game and quickly demonstrated the skills that endeared him to Browns General Manager Tom Heckert on draft day. His second and third runs each went for six yards, and his fourth was a one-yard burrow over right guard for a touchdown. Hardesty had another six-yard run, breaking through a tackle. Then on his seventh attempt, Hardesty did not get up after gaining two yards. He was quickly surrounded by Browns' medical personnel. Hardesty left the field on his own and then was swarmed by five medical personnel as he sat on a table on the sideline. After a few minutes, Hardesty walked dejectedly to the locker room with a trainer. He finished with 25 yards and the TD on seven carries. Coach Eric Mangini said he won't know the extent of Hardesty's injury until tests are completed. James Davis replaced Hardesty and made an emphatic case to make the final roster. Davis, locked in a battle with Chris Jennings as a reserve back and special teamer, rushed 15 times for 66 yards and had gains of 12 and 14 yards on short Colt McCoy completions. Jennings had 18 yards on five carries. Speaking of McCoy, the rookie finally had some fun and reason to feel good about his first NFL preseason. But it didn't start out that way. McCoy fumbled the first snap from rookie Shawn Lauvao -- who started at center and probably added that backup role to his starting job at right guard. McCoy then suffered a sack on his fourth play when he tap-danced in a well-formed pocket. But McCoy showed the resiliency that made him the NCAA's all-time winningest quarterback at Texas. Playing into the third quarter, McCoy regrouped and went on to complete all 13 passes he attempted for 131 yards. He was sacked three times. Last week, McCoy said he never practiced a single play he ran in the Detroit game. He obviously got more reps in two days of practice this week, and it showed. McCoy, though, may have broken a bone in his left (non-throwing) hand. Defensively, the Browns' "starters" for this game allowed Chicago quarterback Todd Collins to complete six of his first seven passes in his first outing with his new team. Collins, an old pro entering his 16th NFL season, needed only three plays to find the end zone after McCoy's first-play fumble. Collins flipped an easy touchdown to tight end Greg Olsen from 15 yards. Olsen beat backup safety DeAngelo Smith by about five yards. Collins finished the first half completing 10 of 15 for 139 yards. His passer rating was 118.5. Backup running back Chester Taylor hit the Browns for 23 yards on four carries. The Browns fielded a defensive unit to start the game that included mostly backups. Rookie Joe Haden got a few reps at cornerback. The linebackers were Jason Trusnik, David Veikune, David Bowens and Marcus Benard. Veikune, Trusnik and Benard were still playing into the fourth quarter. Usually, playing time in the fourth quarter of the final preseason game is a ticket to the waiver wire. But Benard might be the team's best pass rusher at linebacker and he was working with the No. 1 unit earlier this summer. Ratliff's winning drive at the end took receiver Jake Allen off the hook. Ratliff had the Browns close to scoring territory with 4:29 left in the fourth quarter when his pass deflected off Allen's hands and was intercepted by Bears safety Aaron Webster. The Browns' deep backups denied Bears rookie quarterback Dan LeFevour the chance to savor victory. LeFevour moved the Bears to the Browns' 39, but was flattened for a sack on third down by defensive end Brian Sanford.